From the wild and rugged to the picture postcard perfect – grab your bucket and spade and get stuck into a proper British Summer Holiday! The UK may hardly be known for its reliable weather, but, come rain or shine, a trip to any of these stunning beaches won't disappoint. From rocky shorelines to secluded island beaches, these are just some of the beaches in the UK that make 'staycations' so popular with the Brits. Afterall, when you have these beauties on your doorstep, why would you go any further? If you’re looking for the perfect taste of English nostalgia (with the added bonus of being easily accessible from London for a day trip), the seaside town of Brighton offers the typical English summer experience. Stroll along the promenade, play the arcades on the Pier, ride the carousel, and - of course - enjoy some classic fish ‘n’ chips. For a more active experience, head to the popular family holiday destinations of Cornwall and Devon for great surfing and adrenaline fuelled activities. For a unique experience, the coastline stretching from Devon to Dorset is England's first natural UNESCO World Heritage site; known as The Jurrassic Coast. This beautiful beach offers a geological walk through time - with rock from the Triassic, Jurassic and Cretaceous periods (that's 180 million years of history!) Many of the earliest discoveries of dinosaur fossils were made in this area, and you may be lucky enough to uncover a fossil or two of your own. If rest and relaxation is what you’re after, head to the magnificent beaches of Wales or Scotland where you can be find yourself strolling alone in the surf. Many of the beaches here are Blue Flag rated and are equally as breathtaking in the winter time when the rugged coastline takes on a life of its own. In Scotland, experience a typically dramatic coastline with mountain scenery, unique flora and unspoilt islands. 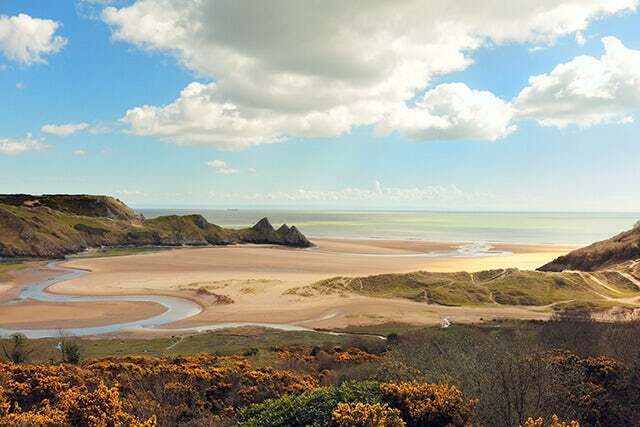 In Wales, you can visit three beaches that are regularly voted Britain's best; Rhossili, Three Cliffs Bay and Barafundle. So what are you waiting for? Explore some of Britain's best beaches this summer!